Whimsical illustrations combine with cheeky verses in this quirky, hilarious alphabet board book featuring monsters from all over the world. 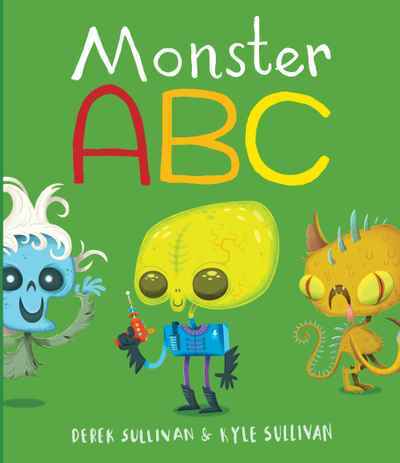 Featuring tongue-in-cheek humor for adults and unhinged delight for kids, this alphabet book is full of silly monster fun from Alien to Zombie. Whimsical illustrations combined with winky verses add levity throughout, making this the perfect book to make you the coolest mom, dad, aunt or uncle ever. Monster ABC covers the full monster spectrum: Some are well-known (e.g., Alien, Ghost, Zombie), some are regional favorites (e.g., Jersey Devil, Sasquatch) and some come with a passport (e.g., Banshee, Krampus, Quetzalcoatl). These gorgeously quirky monsters and silly verses will prove there's nothing to fear.